Organized labor works for change in a number of ways. When collective bargaining is not successful, other actions put pressure on employers. 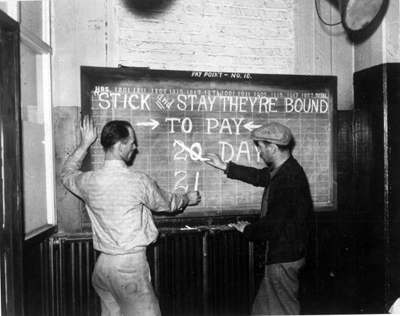 Work stoppages, known as “strikes,” are sometimes used. The word “strike” is an old term that comes from the actions of sailors. When treated badly by their officers, sailors would “strike” or lower the sails to stop the ship. The sailors would not raise the sails until they reached an agreement for better treatment. Employers in turn use actions like lockouts. They would hire non-striking workers to keep production running during a strike. Judges sometimes use the law to stop workers from striking. Businesses and labor unions both try to put pressure on the government to pass laws in their favor. Both have used violence to achieve their goals. Employees refuse to work. There are several different types of strikes. Workers slow the pace of work but remain on the job. It is illegal for some workers, like nurses or police, to go on strike. These workers may take part in a sickout. In this case, work slows because employees call in sick. They may also work to the rule. This means causing a slowdown by carefully following every single rule that the employer has set. Union members sometimes share information with the public before a strike. They gather at a place of business and carry signs. The signs describe the conditions or problems of the workers. Mary Harris was a famous organizer known as Mother Jones. She organized informational pickets and children's marches in 1903 to bring attention to child labor and working conditions in the mines. Members, families and friends refuse to use particular services or buy particular products. One example is the Grape Boycott, which lasted from 1965 until 1970. The United Farm Workers formed to fight for safe working conditions. They also wanted to end child labor, poor wages, and unfair treatment. They asked Americans to stop buying table grapes from growers who would not agree to these demands. Detroit was one of the first cities to support the effort. The boycott ended successfully after 5 years. A lockout is any method by which an employer prevents employees from working. It usually means that an employer shuts down a plant or factory. A famous lockout took place at the Newton Steel plant in Monroe in 1937. A picket line formed. Newton Steel closed the plant, saying that it was blocked by strikers. A more recent example is the 2011 National Football League lockout. During contract negotiations, team owners want to put pressure on players. Players must train during the off-season to be in shape, but the team owners shut down the training facilities to make training harder. An injunction is a court order that tells parties to stop doing certain things. An injunction can be issued to force strikers to return to work. It may also be sent as a warning for workers to not walk off the job. During a strike by the American Federation of State, County and Municipal Employees (AFSCME) in the 1970's, a federal judge in Detroit ruled that the strikers were forbidden to carry picket signs. The strike was legal, but the signs were not legal. AFSCME went on strike. No signs were used. All of the strikers wore T-shirts that said "on strike". Injunctions are sometimes used by unions as well. 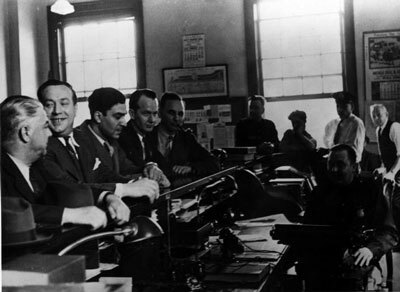 The United Auto Workers obtained an injunction that prevented the Monroe Auto Equipment Company from moving a factory to the south. Some industries can be hurt by bankruptcy or labor disputes. The federal government may see these situations as dangerous to the economy or to national security. In these cases, the government can take over or “nationalize” private companies. Nationalization prevents further problems. In 1946, a national railroad strike brought transportation to a standstill. President Harry Truman said that he would nationalize the railroads. The strike was settled before he took action. Organized labor and businesses often work together without strikes. Collective bargaining is a series of talks between employers and employees. The goal is to agree to wages, hours and working conditions. The United Auto Workers make new contracts every several years. They select one car company as the target for new contract talks. Collective bargaining leads to a contract with that company. This agreement, called a pattern contract, is used to design contracts for all of the other car companies. Some collective bargaining leads to a win for one side and a loss for the other side. Mutual gains bargaining is based on finding common goals. It results in an agreement that both sides can accept and support. Strikes sometimes become violent. At times, angry workers destroy company property. Crossing picket lines results in insults and attacks. Many early strikes, like the 1894 Pullman strike, ended in rioting. 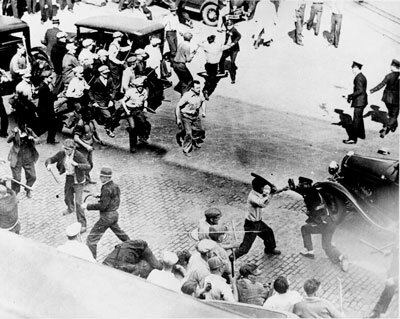 The history of organized labor includes acts of violence on both sides. Many examples are of violence against workers. The Colorado National Guard attacked striking miners in 1914. The nineteen people who died in Ludlow, Colorado included two women and twelve children. In 1937, striking Republic Steel workers and their families were met by Chicago police officers. Ten strikers died and 90 were injured while retreating from police armed with clubs and guns. 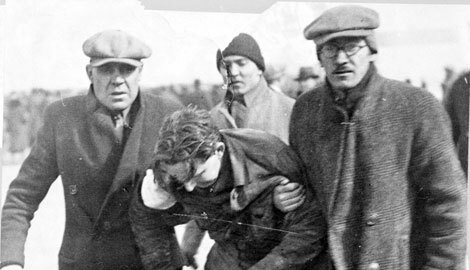 Security guards severely beat union organizers at the Ford Rouge plant in 1937. They went on to attack women who were handing out leaflets. It's important to remember that people fought and died for rights that we now take for granted. See photos from the period to see what life was like for the working Americans. No photos have been added to this exhibit. No oral histories to display. We love to hear your thoughts and memories. Please follow the rules of discussion for our website.